Follow the flow inm cities like New York, Chicago and Los Angeles. Get the inside scoop on how 99% of Americans get their water. See what the next generation of water tech may bring. When we turn on a faucet, we expect clean, pure water to flow out. We also expect our cities to provide ample water for industry, fighting fires, and cleaning streets. Public water supply systems in the United States serve about 267 million people- about 99% of the population - but most of us know little about the vast networks of aqueducts, pipes, and pumps that make this possible. CITY WATER SYSTEMS expamins how clean water gets to millions of taps in Chicago, New York City, and Los Angeles, as well as telling the colorful history of the water systems in thise cities. Along the way, Modern Marvels documents the history of public water systems worldwide, from the time of the pharaohs to today. Finally, we'll get a glimpse of cutting-edge modern technologies, including a new state-of-th-art desalination plant in Tampa, Florida. Its the dirty secret of what happens when you flush--and it's surprisingly sophistica ted tale. Experts debunk urban myths and reveal surprising true talkes. A simple flush and it's forgotten. But haven't you secretly wondered where it all goes when we go? Join MODERN MARVELS to explore this less-than-poite topic, and examine the network of underground pipes and tunnels that carries human waste (and much else) away. 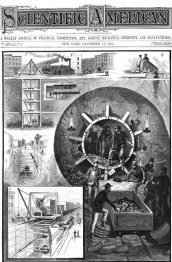 SEWERS flows through history from ancient Rome's pristine sewage-conveying systems, through the foul, out-the-window system of Europe in the Middle Ages, and into the revolutionary sanitations engineering of the 19th and 20th centuries. Delve into the sewers of Paris, Boston, and Los Angeles to study waste management's evolution. Meed a sewer diver (and his robotic counterpart) who inspects and ensures the efficient operation of the conduits; decipher the myths about "treasures" and creatures found in the murky depths; and fin out exactly where it goes, how it gets there, and how we've learned to use it to our benefit. From Ancient Rome to the massive system that quenches Los Angeles's thirst, thisis a facinating look at the history and technology of aqueducts. They are arguably the most importatn public workds projects in history. Without aqueducts, many of the world's great cities and civilizations would never have existed. 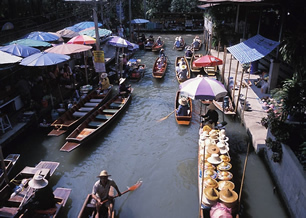 For thousands of years, we have shaped the world andforged history by controlling the flow of water. From the continent-spanning constructions of ancient rome to the lifeline that auenches Los Angeles's thirst, MODERN MARVELS takes a prbing look at the history and technology of AQUEDUCTS. See how ancient civilizations solved their water problems with exqquisite networks of channels and pipes, some laid centuries before the birth of Christ. Relive the long fight to bring water to Los Angeles, where 100,000 men labored to fulfill the vision of one man, and a great city was truly born. Extensive footage shows the construction of the massive system that brings water across hundreds of miles of harsh desert. Finally, get an up-close look at the most modern water systems on earch, high-tech marvels that cost billions of dollard, but without which cities would die of thirst. They Block the force of a river, produce enough electricty to power cities, move water o ver hundreds of miles and irrigate fertile valleys. 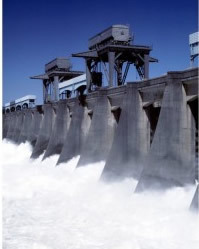 Dams prevent floods and produce "green" energy. We'll visit a hydroelectric dam, the most technologically advanced type of dam, and a dam in Brazile that is five times the size of the Hoover Dam. At the Utah States University Water Research Laboratory Hydraulics Lab in Logan, Utah, we watch a model of a dam crumble beneath tons of water and discuss how future dam failures can be averted. 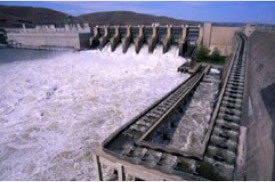 We will learn how dams adversely affect river systems and as a result, there are many proponets of dam removal. Documentary Version: 1 hr. 27 min. Overview Version: 15 min. 54 sec. Liquid Assets tells the story of essential infrastructure systems: water, wastewater, and stormwater. These systems- some in the ground for 100 years- profide a critical public health function and are essential for economic development and growth. largely out of sight and out of mind, these aging systems have not been maintained, and some estimates suggest this is the single largest public workds endeavor in our nation's history. Whaddaya Know About H2O? educated young viewers about water conservation, its characteristics, and its role in society through 30 self-contained, one-minute segments. Each segment covers one topic and combines colorful and stimulating visuals with fast-paced, kid-friendly explanations to ensure that viewing is as entertaining as it is informative. Most importantly, this program meets the expectations of today's media-savvy kids with compelling visuals, real-world examples, and fun facts. Choose this innovative educational program and watch learning come alive for the next generation of water consumers! Each segment covers one water topic. An ideal teaching tool, the video comes complete with Teacher's Guide. A valuable utility public realations resource to show on tours or loan to the community. Meets National Educational Standards for science, vocabulary, and geography. This fun-filled youth-education video takes kids ona tour of a municipal water plant. Basic scientific pronciples involved in water treatment are explained. Great for school visits. A classroom field trip has never been so much fun! 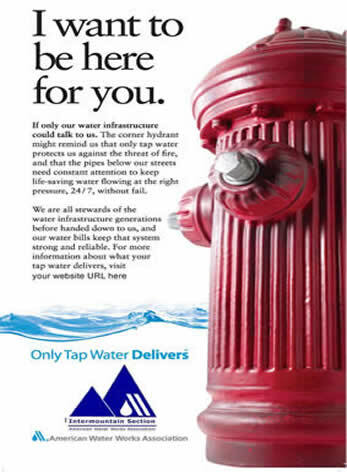 Only Tap Water Delivers is a grassroots and media campaign to help utilities and public officicials communicate the value of tap water service and the need to reinvest in water ingrastructure to consumers, media and other stakeholders. Encourage community investment in water service and resources. Provide utilities with tools that help them communicate with consumers and decision-makers about the value of water service. Encourage and equip public officals to speak about the importance of investing in water service and resources. Elevate the value of water service in the minds of consumers.